Also known as Tullamarine Airport (the name of the district in which it's based), Melbourne Airport is the only international airport in Melbourne and one of the busiest in Australia. Our Melbourne Airport guide includes contact details, as well as information relating to terminal facilities, public transportation routes and nearby hotels. The Travellers Information Desk (tel: +61 3 9297 1805), located in the Arrivals area of Terminal 2, is open from 0700 to midnight every day. There is also an information desk in the departures area. From Melbourne city centre, take the northbound CityLink toll road/Route 43 (this becomes the Tullamarine Freeway), which leads to the airport. It's possible to avoid toll fees using the Western Ring Road instead. The total drive time from Melbourne (using the toll road) is approximately 25 minutes. Terminals 1, 2 and 3 are located within the same complex and are linked by covered walkways. Terminal 4 is adjacent to the main building. Bus:SkyBus (tel: +61 1300 759 287; www.skybus.com.au) operates every 10 minutes, 24 hours a day, between Melbourne Airport and the city centre's Southern Cross Station (journey time: 20 minutes; fare: A$19). A number of public buses (tel: +61 1800 800 007; www.ptv.vic.gov.au) connect the airport with destinations in and around Melbourne. SmartBus 901 links to Broadmeadows Station, which has rail links to the city centre. Information on all routes and schedules is available from the information desks in the terminal building or from the airport's website. Tickets for all buses can be purchased online or at the ticket offices outside Terminals 1 and 3. All buses depart from outside Terminal 1. Taxi:Taxis into the city centre are available from local outfits, including, 13 Cabs (tel: +61 13 2227; www.13cabs.com.au). The journey time into Melbourne is approximately 30 to 40 minutes, depending on traffic conditions. Fares start at around A$60. For those looking to make the transfer from the terminal to central Melbourne in style, a helicopter taxi service is available (tel: +61 8587 9700; www.airmelbourne.com.au). The journey time is a speedy 6 minutes and the single fare is A$274. Banking and currency facilities are available from the ANZ bank branches in the departures and arrivals areas of Terminal 2. In addition, Travelex bureaux de change kiosks are located in the same terminal. ATMs are positioned throughout the airport. A large variety of cafés, bars and restaurants are available in Terminal 2, including a tapas bar and eateries serving international and local cuisine. Terminal 3 has a few options ranging from fast-food outlets to cafés and bars; while Terminal 4 has a small choice of juice bars. Terminal 2 has the most choice when it comes to shopping. As well as GST-free and Downtown Duty-Free outlets, the terminal houses a range of fashion boutiques, gift retailers, bookshops and newsagents. Terminal 3 has a smaller selection, while Terminal 4 is home to a newsagent's. Left-luggage facilities are available in the arrivals area of Terminal 2. Terminal 1 lost property enquiries (tel: +61 3 8336 4100) are dealt with separately from those in the rest of the airport, which are handled by the Travellers' services (tel: +61 3 9297 1805). Other available facilities at Melbourne Airport include baby-changing rooms, a pet hotel, a medical practice and a pharmacy in Terminal 2, as well as a prayer room and showers (also both located in Terminal 2). There are a number of airline lounges for passengers in the departure areas. Extensive conference and meeting facilities are provided by the ParkRoyal Melbourne Airport hotel (tel: +61 3 8347 2000; www.parkroyalhotels.com), which is linked to Terminals 2 and 3 via a walkway. The Holiday Inn Melbourne Airport (tel: +61 3 9933 5111; www.ihg.com), which is a short shuttle bus ride away, also offers business facilities and meeting space. Free Wi-Fi internet access is available in Melbourne Airport, in the public areas and departure gates of Terminals 2, 3 and 4. Qantas provides free Wi-Fi access in Terminal 1. Internet kiosks are located at various points within each terminal. Public telephones can be found throughout Terminals 1, 2 and 3. Wheelchair-accessible toilets, travelators and lifts are provided throughout Melbourne Airport. A TTY telephone is available for use on the ground floor of Terminal 2. Wheelchairs can be requested from individual airlines; passengers should inform their airline in advance or contact the Travellers' Information Desk. Disabled parking is available in the on-site car parks. Any passengers who may require additional assistance are advised to contact their airline before travelling. 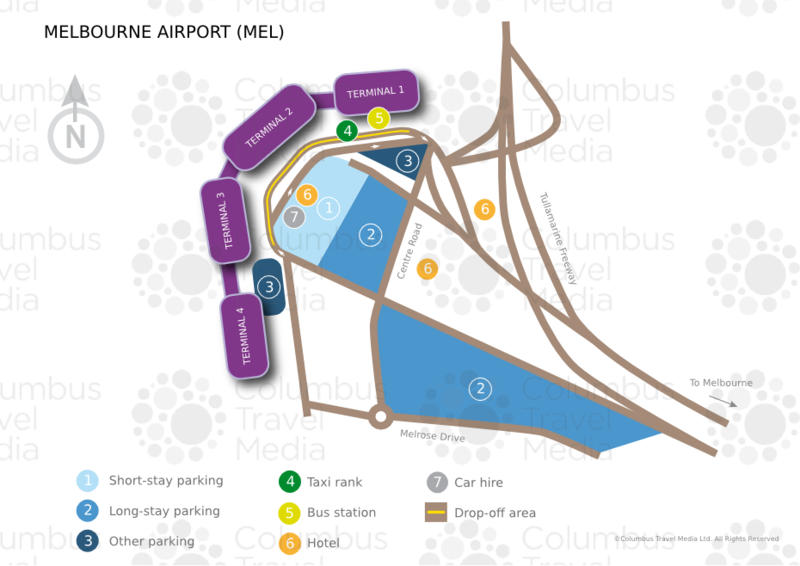 Melbourne Airport has long- and short-term car parks, as well as express and business parking – all car parks are open 24 hours a day. Short-term parking is located in the multistorey car park in front of the passenger terminals, to which it is connected via covered walkways. A free, 24-hour shuttle bus runs from the main long-term car park to the terminals, while the multistorey long-term car park is located opposite Terminals 1, 2 and 3. Express parking is available next to Terminals 3 and 4. The business car park offers sheltered parking and is a short walk from Terminal 1. Car hire companies at Melbourne Airport include: Avis, Budget, Europcar, Hertz, Redspot and Thrifty. These operators have desks in the domestic terminals and offices on the ground floor of the short-term car park.